We’re very pleased with our chosen line-up of wonderfully creative makers for our Festive Market on Saturday 12th December, 11am – 4.30pm at the Inverkeithing Civic Centre. We’re going to kick off the individual listings with the makers new to Inverkeithing Arts Initiative. We are delighted to welcome these amazing makers, and look forward to getting to know them and their work. 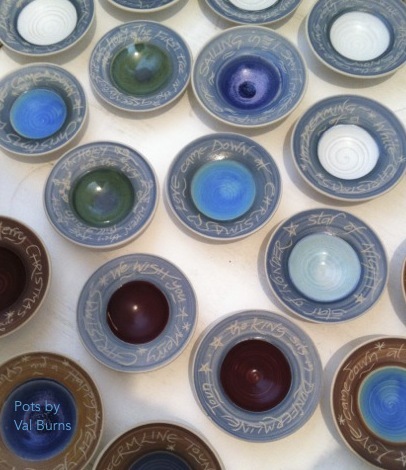 Pots by Val Burns is based in the beautiful heritage-rich Fife town of Culross. 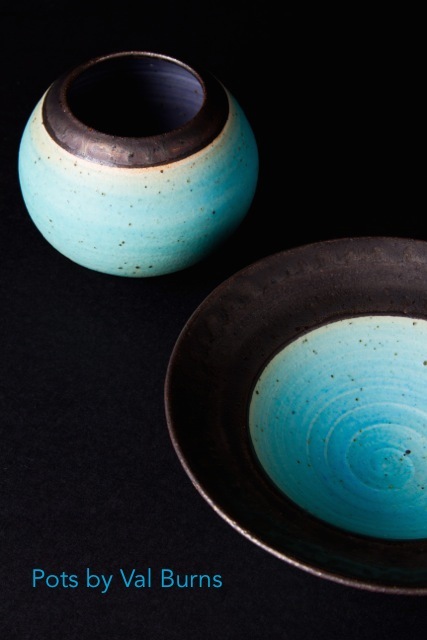 Her pots are made on the wheel or hand built, richly coloured and make ideal gifts. At Christmas time she makes a variety of special vessels, such as useful little dishes for candles, including ones with Christmas carols around their rims. She also designs and makes her own decorations, from minimal style porcelain to pretty hearts on ribbon. These are beautiful either on the tree or to decorate special parcels.